"A long stone table filled this room. Above it floated a human heart, swollen and blue with corruption, yet still alive. It beat, a deep ponderous throb of sound, and each pulse sent out a wash of indigo light." The 2018 A Game of Thrones: The Card Game Regional Championship begins soon, and our list of Regional Championship venues is now available online. 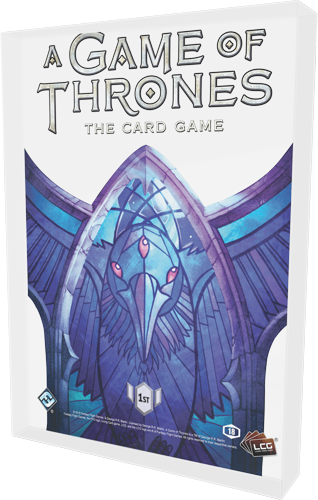 As you look for new ways to explore the battles and intrigues of Westeros, the A Game of Thrones: The Card Game Regional Championships loom before you—each one a promise of untold adventures. Will you find gold and glory? Or will you find the dead awaiting you with their icy blades and cold blue eyes? The Seven Kingdoms of Westeros are full of unique and storied treasures, and the deeper you advance in your A Game of Thrones: The Card Game Regional Championship, the more you'll discover. You may even find yourself on the path toward King's Landing and the Iron Throne! 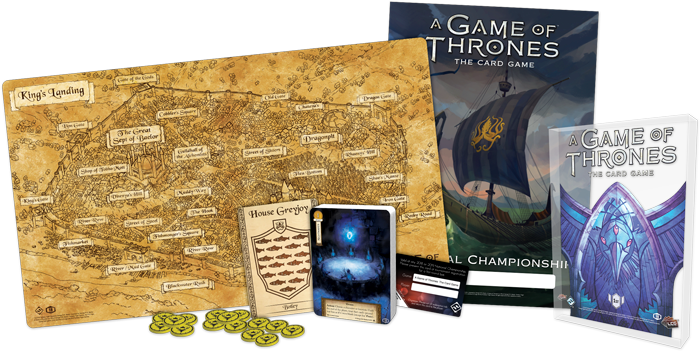 Visit our list of A Game of Thrones: The Card Game Regional Championships to find one near you, or continue reading to see what prizes you may win. Figures of blue shadow seated around a floating human heart. A fleet of ships trapped and set ablaze with green flame. An army of the dead led by commanders with pale blue eyes. There are plenty of things in George R.R. Martin's A Song of Ice and Fire that are worthy of nightmares, but if you are to have any hope of conquering Westeros, you'll need to harness your fears—not succumb to them. 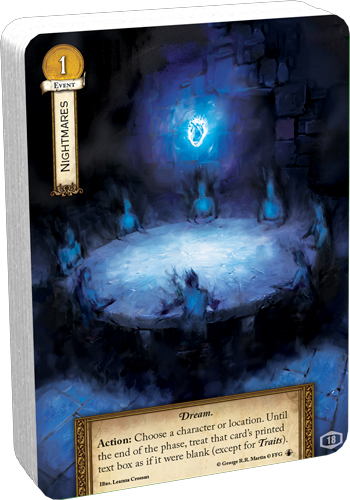 Each participant in a 2018 A Game of Thrones: The Card Game Regional Championship receives an alternate art version of Nightmares with artwork by Leanna Crossan, drawing on imagery from Daenerys Targaryen's journey through the House of the Undying. Make your way into the Top 16 at a 2018 A Game of Thrones: The Card Game Regional Championship, and you'll receive a set of fifteen acrylic tokens, styled gold with black paint, and decorated with House Baratheon's crowned stag. If you fight your way into the Top 8 at a 2018 A Game of Thrones: The Card Game Regional Championship, there can be little doubt that you've got your eye on larger things—like King's Landing and the Iron Throne. 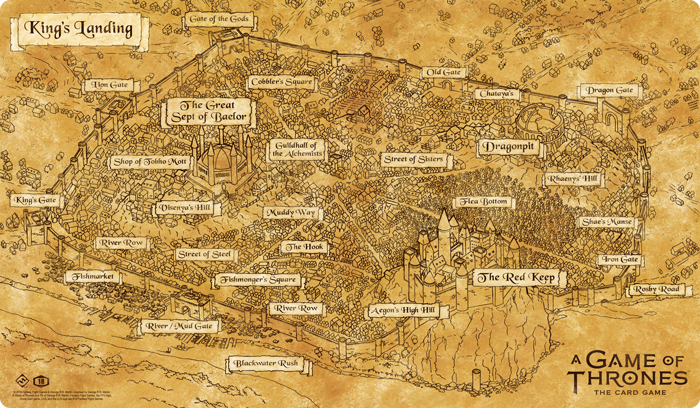 As you continue your pursuit, your Top 8 King's Landing playmat will help you mind the details. This is Westeros, after all, and you could find treachery or uprising around any corner. 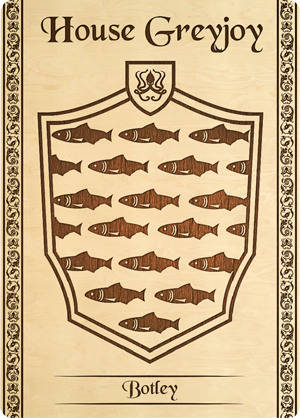 Many of the largest and most significant conflicts between the Great Houses have hinged upon the actions of their vassal houses, and the Top 4 players at each Regional Championship will be reminded of this fact by their wooden faction cards that suggest the support House Greyjoy has long received from House Botley. To win a 2018 A Game of Thrones: The Card Game Regional Championship, you'll need to win countless battles. You'll need to time your schemes just right—and survive your opponent's most devious plots. You'll need to endure the most outlandish atrocities. And you may need to step off your high horse and get your hands dirty, as well—with poisons, lies, betrayals, and dark magic. There's no guarantee your victory will be easy, but you can bet it will be eventful. The Seven Kingdoms are home to all manner of wonders and terrors, and you'll likely find many of both on your path to victory. In fact, you'll have gained a greater insight into the nature of Westeros than most, and you'll find that insight reflected in your Regional Championship trophy—which depicts the three-eyed raven. Despite your insight, however, your path won't lead you away from the concerns of Westeros and its people. Instead, you'll be called to take action more fervently than ever—to fight for your House on a larger stage, at the next National Championship. 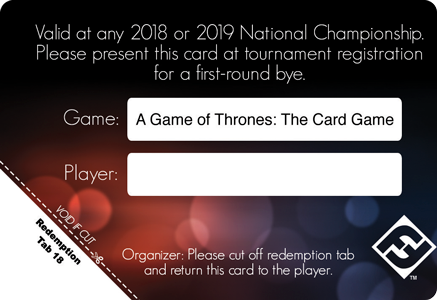 The winner of each 2018 A Game of Thrones: The Card Game Regional Championship will win a Regional Championship card to be redeemed for a first-round prize bye at an upcoming A Game of Thrones: The Card Game National Championship! The 2018 A Game of Thrones: The Card Game Regional Championships are a great opportunity to experience the game at a high level. But they're more than just that. They're an opportunity to meet the other players willing to travel far and wide to enjoy spirited jousts. They're an opportunity to forge new friendships and to learn from your region's best players. Enjoy the only game that matters. Find a 2018 A Game of Thrones: The Card Game Regional Championship near you!